In this article, I’m going to have a thorough look at the most popular theme marketplace for WordPress themes. 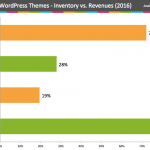 We’re going to try and understand what are the pros/cons of selling WordPress themes on ThemeForest. The article Is ThemeForest a Good Place to Sell Your Premium WordPress Theme? appeared first on Freemius.